"Geri has a unique way of coaching. Our simple coaching conversations with subtle clues enticed me to start thinking outside the box. Geri moved my strong traits of leadership from good to great. Geri helped me to understand how simple use of words, body language, mannerisms and communication style can translate into effective & creative leadership. She helped me to become a better leader; one who feels more empowered and has earned the unanimous vote of confidence from his peers. I am a better physician, I'm simply a better listener and my patients are more satisfied than ever. My peers tell me that I exemplify leadership effectiveness and demonstrate more understanding and support. Now I can interact more favorably with enhanced communication skills. I find myself fortunate to have an association with Geri and this was the best thing that ever happened to me at this stage of my professional career. Thanks again Geri! Job well done." 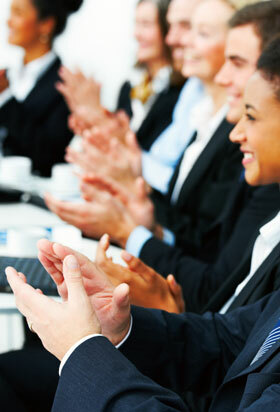 "Geri's style of coaching is one of complete professionalism and caring. She tailors her approach to the individual while still covering all aspects of performance. A pleasure to work with and learn from." "Geri offers a rich concentration of experience, wisdom, and resources. We established a wonderful rapport within minutes of our first conversation, and I knew immediately that she was the right coach for me. Geri provides honest feedback in an objective, supportive, and enlightening manner. She has inspired me to discover new truths about myself as well as to rediscover old ones that I had forgotten. I am very grateful to Geri for the tremendous positive changes she has helped me make in my life both professionally and personally." "Geri Grossman was a colleague of mine at Ingram Micro and during those years together Geri demonstrated knowledge and expertise in working with organizational leaders. Geri was instrumental in developing leaders at all levels in the organization. Her coaching and feedback skills are excellent and she knows how to help leaders get to the core of their challenges. Geri is very skilled at diagnosing and analyzing what the problems are and creating a mutually acceptable plan of action with the developing leader. Geri's experience is both broad and deep and this gives her the unique ability to significantly influence a leader's growth. As colleagues at Ingram Micro, Geri was acknowledged for her success as an organizational leader by the CEO for her role in both managing a department and for being instrumental in influencing the adoption and acceptance of the corporate values championed by the CEO. Geri is a professional coach and leader who can help any leader move the next level." "Geri’s seasoned and unique approach to executive coaching has supported hundreds of our leaders to become even more effective in their leadership role in our global organization. As a result of Geri’s guided feedback and support, many have been prepared for greater leadership roles and responsibilities." "Geri was recommended to me as an Executive Coach at a time where I was looking to enhance my leadership competencies. I had recently changed industries and I was struggling with a new culture that didn't mirror my past work experiences. Through Geri's feedback and expertise I was able to identify opportunities for change and growth and adapt my leadership style that has greatly enhanced my working relationships at levels within the organization. Without Geri's guidance as an Executive Coach I am certain I would have limited my potential for success in my current role and certainly would not be positioned to take on new and higher level leadership roles. Many thanks to Geri!" "Geri is one of the best leaders in human resources that I have been privileged to work with. Her people skills, insights and empathy are at the top of the chart. I would not hesitate to work with Geri again and highly recommend her to all leaders looking for outstanding people leadership. I have found that whatever business success I have achieved can almost always be tied to the effectiveness of the team of people that surround me. Geri's ability to judge, lead and motivate that team is unquestioned in my mind." "I was a new Sr. Leader at a rural NY hospital when Geri was engaged, at the request of my immediate supervisor, the CEO to help me become a more effective leader. I had a very strong mgt background coming in, but something wasn’t ‘clicking’. Everyone thought I had the tools to be successful, but for some reason I wasn’t using them (something was getting in the way) to accomplish the goals and objectives that we all knew could be achieved. I wasn’t being the success that I wanted to be and my boss wanted me to be. During the time that Geri and I worked together she helped me understand that the image I believed to have of myself; and how I believe I was perceived, and how that was indeed different than how I was actually seen and perceived by my direct reports and others in the organization. Through her guidance, role playing and coaching techniques, I think the relationship with my direct reports, peers and my boss has changed dramatically. In addition, Geri provided me with a number of tools including relevant articles and other techniques, that I have since put into practice that have allowed me to “unblock” those barriers to success. I must say that it was time well spent. Thanks." "I never knew how much value could be added to my personal and professional life through coaching with a professional like Geri. Geri has an innate talent for coaching. Her efforts have given me the additional support I needed which has enhance both my personal and professional development. Geri brings a unique blend of her listening skills, analytic talents and infinite wisdom that are powerful and empowering. Following each session, I feel I have discovered something new deep within...a capacity and/or talent that has not been tapped which enables me to attain the goals I have set for myself. Based on my experience, Geri provides me with the tools to self-sustain my growth and development through a wide variety of resources. In many ways it is as if I have discovered a new set of wings with which I can soar!" I couldn't have done it without you."